Growing in moist woods, among / Cinamon [sic] ferns. & under swamp maples- / Taste, gluy [sic] sweet. / Surface of Pileus very viscid, sticky- / convex golden yellow turning dark / brown with age- / turning tawny- / Pore surface- light straw color ^ mouths / largish- [sic] round angular- pores, slightly / adnate, deeply depressed round stem. / Meat of Pileus & pores not changing / color when cut. but base of stem / turns slightly blue when cut / Stem, straw color- reticulated, from [sic] / about an inch from the top down to the / Boletus curtisii? somewhat bulbous base with light / brown veins,. stem, fleshy solid or / stuffed, firm & hard to the touch / Aug 26- 1900. 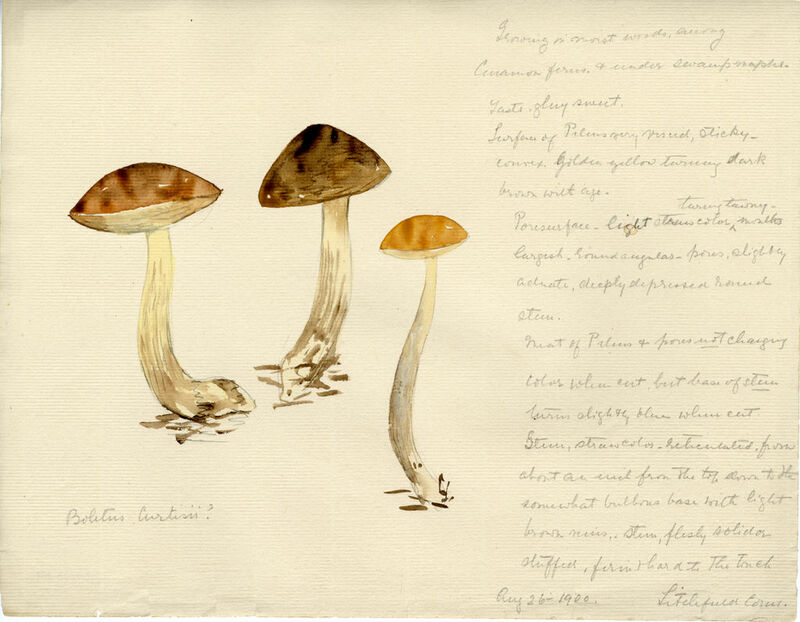 Litchfield Conn.
Delafield, Violetta White (botanist, mycologist, and garden designer, 1875-1949) and Culture: American, “Boletus curtisii,” Stevenson Library Digital Collections, accessed April 20, 2019, http://omekalib.bard.edu/items/show/2588.